Did that headline get your attention? Who really wants to waste money on a translation project? Unfortunately, we’ve had clients who, with the best of intentions, have frittered away their precious budget, all because they thought they were taking steps to save money. Sometimes, in attempting to cut corners and save costs here and there, you can actually make your translation project more expensive. Here are some of the most common mistakes we’ve seen. Now, we haven’t seen a client ask us to translate a document written in crayon by a small child, but we often receive files that we can’t easily edit. The type of file you provide matters. Whenever possible, get the editable source file for the document, often a Microsoft Word or InDesign document, and avoid .pdfs and .jpegs. A good rule of thumb is to provide a document that we can put a cursor in, and directly edit the text. This makes it easier (and less expensive) for us to do our job. If it’s something we can’t directly edit, it’s going to cost you more time and money. We understand of course that sometimes you have a handwritten document or simply don’t have access to an editable file—that’s completely fine! But if an editable file might exist, then spending a little time searching for it can save time and money down the road. We once worked on a huge project where our client wanted to do an internal review of all of the documents. The internal reviewer, who spoke the language the document was being translated into, took all these files, hand wrote all the edits, scanned the pages, and sent them to us. On the surface, the client was trying to be thorough and do the right thing. Unfortunately, because the edits needed to be applied by our design team who didn’t speak the reviewer’s language, we had to pay someone to translate and type up the edits. It doubled the amount of work and expense. If they had just used a PDF comment tool, it would have saved time and money. Whenever possible, try to provide comments and feedback using the PDF commenting tool. Sometimes, this isn’t possible and we understand! We always try to accommodate what works best for your organization. But, by using the PDF commenting tool, you can save time and money on your translation project. We’ve also seen instances where an organization tries to translate a document with a bilingual staff member or with a tool such as Google Translate. The client then asks us to edit this document, thinking that it should be faster, easier, and less expensive. Unfortunately, this is hardly ever the case. If the initial translation is not done well, it’s going to take longer to edit it than it would be to create the translation from scratch. We know that nobody intentionally waits until the last minute to submit a project for translation. Often, it’s more a consequence of either over-ambitious planning, or the simple fact that translation comes last in the life cycle of a document. If the workflow has encountered delays along the way, it’s the translation provider that is left with reduced time to turn around a final piece. Another good rule of thumb is that if a document took a week to write, it’s likely going to take more than two days to translate. 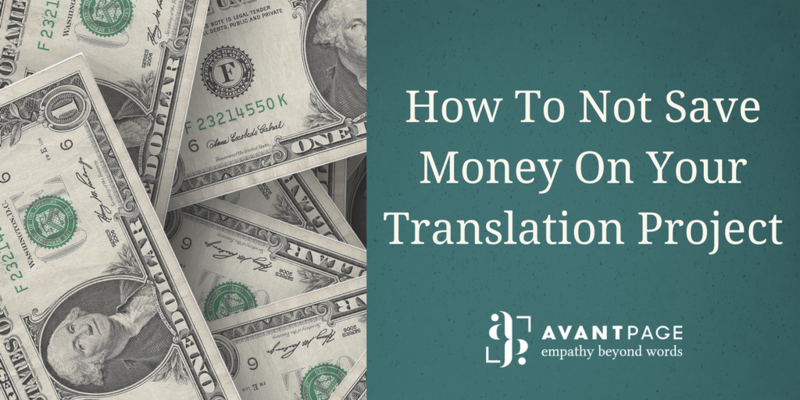 By keeping this in mind and by carefully planning with your translation provider, you can save your organization the expense of rush fees and eliminate the risk of missed quality assurance steps. Sometimes, a client will send a file that is not yet final. For example, the English may still be in the editing process and exist only in draft form. They think this is going to save time because it gives a head start on the translation. Or maybe they just didn’t check if edits were still occurring when they made the translation request. The problem is that a stream of slightly updated versions can cause a lot of confusion, extra time, and, as a consequence, increase the final bill for translation. It’s always worth waiting until content is final before sending it to your language services provider. As you can see, none of these mistakes were made with bad intentions—just by people trying to do their jobs quickly and effectively. At Avantpage, we’re here to help you do just that! So, avoid these mistakes, and you can set yourself on the path to having a translation project completed affordably. At Avantpage, our experienced team can help guide you through the translation process and make it fast and easy. To find out more about our services call us at 530-750-2040 x11, or request a free quote. GET VALUABLE CONTENT DELIVERED STRAIGHT TO YOUR INBOX. SIGN UP FOR OUR NEWSLETTER TODAY! Sign up for valuable news, information and advice. Follow us for vital information and resources.